The realm of premium Chromebooks continues to expand at an exciting rate. As more OEMs roll out next-generation devices with new features to fit the needs and wants of more users, price wars are inevitable. Thanks in part to their exclusive partnerships, Best Buy frequently offers savings on flagship devices that you simply can’t find anywhere else. Today’s deals come in the form of the world’s first detachable Chromebook and a 14″ convertible that is one of the best machines available in today’s market. Possibly overshadowed by the HP Chromebook X360 14, HP’s detachable Chromebook X2 is still a premium device that’s a formidable opponent for more expensive Chromebooks and it offers the near-unique ability to work as a tablet-first machine. Normally $599, Best Buy has knocked $100 off the detachable making it $499. That’s one heck of a deal when you consider that the Pixel Slate with similar specs will run you $800 and it doesn’t come with the keyboard. For $500, you’ll get a Core m3 processor, 4GB RAM, 32GB of storage and the detachable keyboard. Oh yeah, it also comes with the HP Active Stylus. Next up is the Dell Inspiron Chromebook 14. 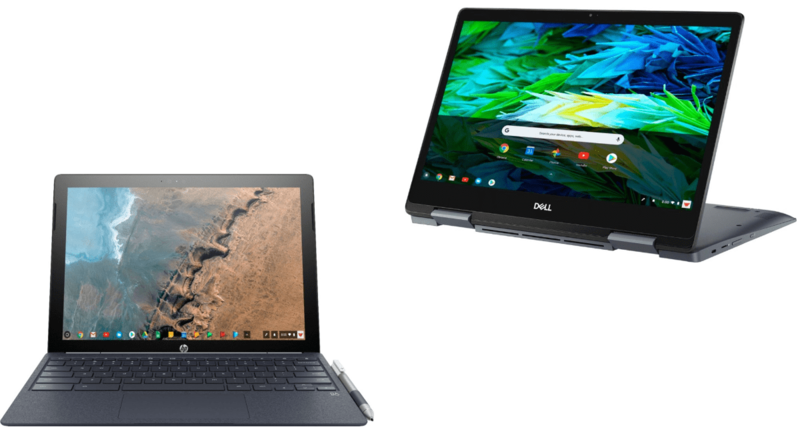 After being relatively quiet on the Chrome OS front, Dell has releases a successor to the aging Chromebook 13 that is worthy to sit among devices such as the Pixelbook and Acer Spin 13. Powered by an Intel Core i3 processor and sporting 4GB RAM and a whopping 128GB of storage, the Dell Inspiron Chromebook 14 is a workhorse that is built like a tank. You’ll also get a stylus with this one and it’s neatly garaged in the base of the device. Best Buy is selling the Dell for $499 for a limited time. One last deal for those looking for the rare premium device with LTE capabilities. Best Buy is selling the Samsung Chromebook Plus V2 LTE for a crazy low $349 when you sign a two-year data contract with Verizon. This Chromebook is locked to Verizon so don’t buy it thinking you’ll pop in a SIM card from another carrier. Not happening.